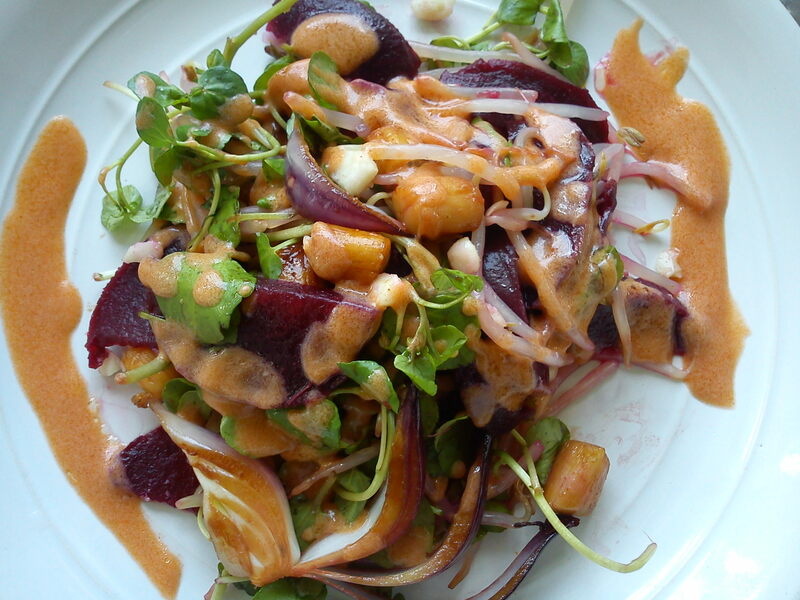 Nutter Scallops salad – Luxury! 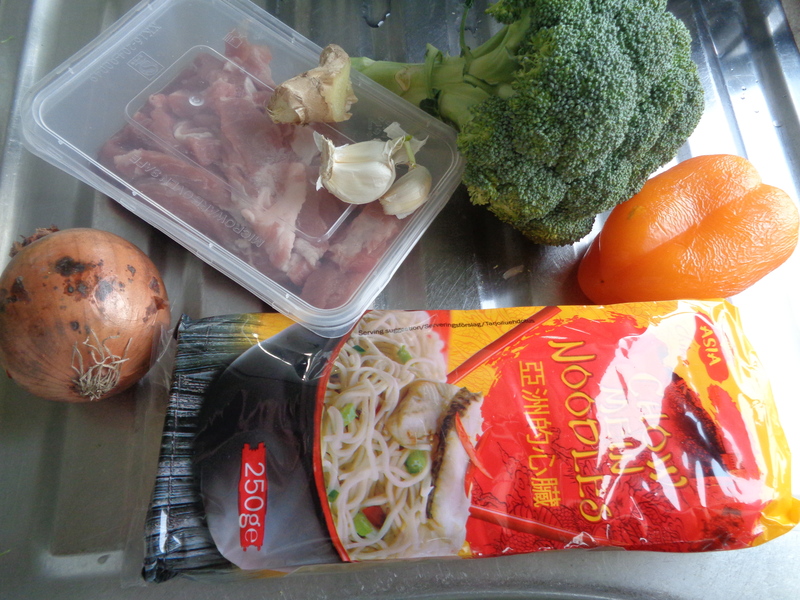 Remove the beansprouts from the package and put them in a heatproof bowl. Using the kettle, boil some water (about 500ml) and pour over them for literally 2 minutes. Drain with a sieve and rinse immediately with cold water. Set aside. 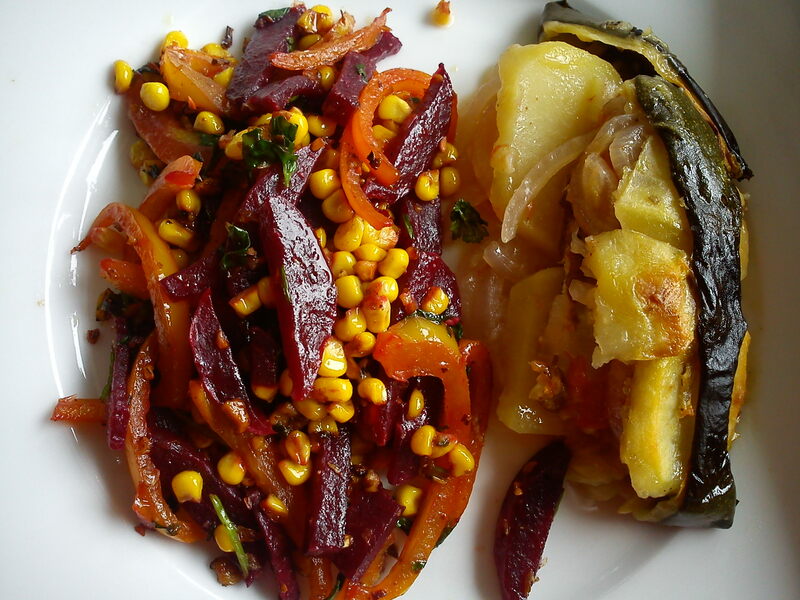 Clean and cut the beetroots and onion in wedges, set aside. Remove and rinse the watercress leaves. Wash the scallops, dust with salt & pepper and also thyme. Mix the vinaigrette by adding all the elements in a jar with a lid. Shake vigorously taste and adjust seasoning. 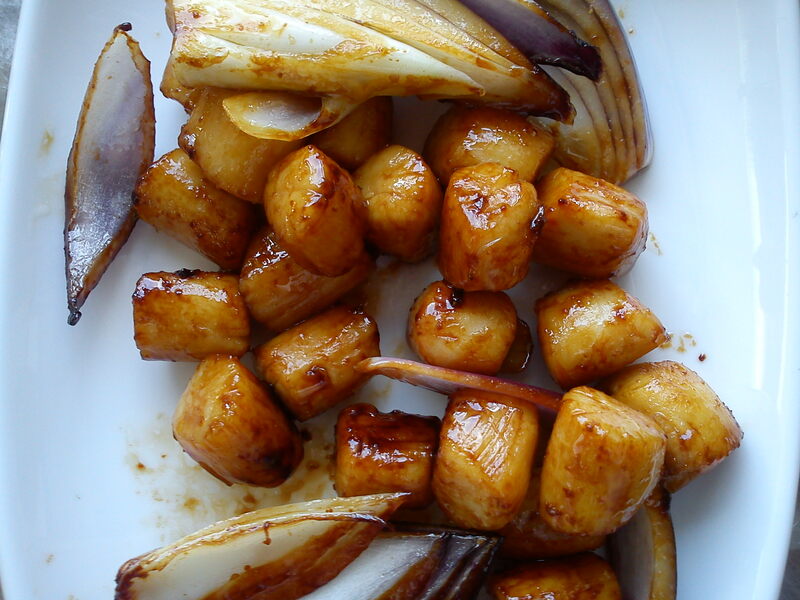 In a frying pan with 2 tablespoons of olive oil, brown the scallops and the onions for 4 minutes, 2 minutes on each side. The scallops are supposed to be cooked only 1 minute on each side, but by leaving them in longer, they release a caramel like sweet substance. 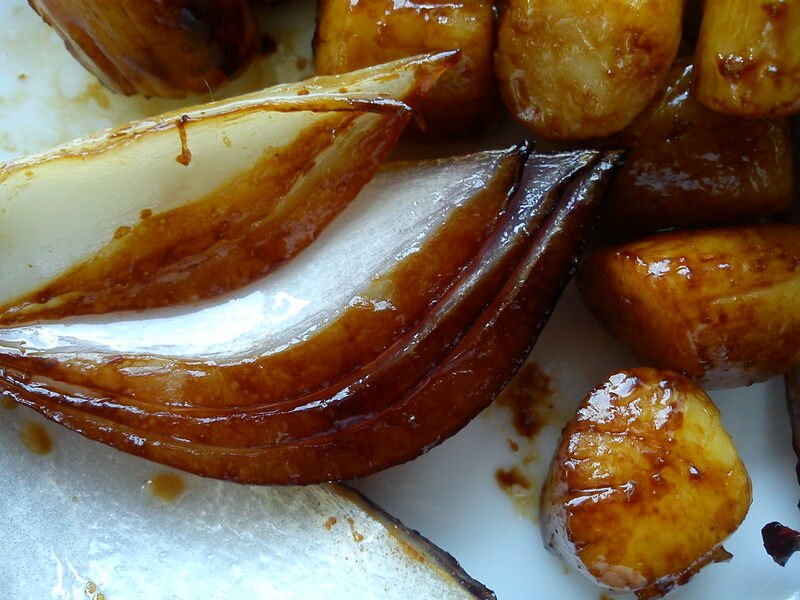 “The caramel” will also add to the sweetness of the red onion wedges while it browns. 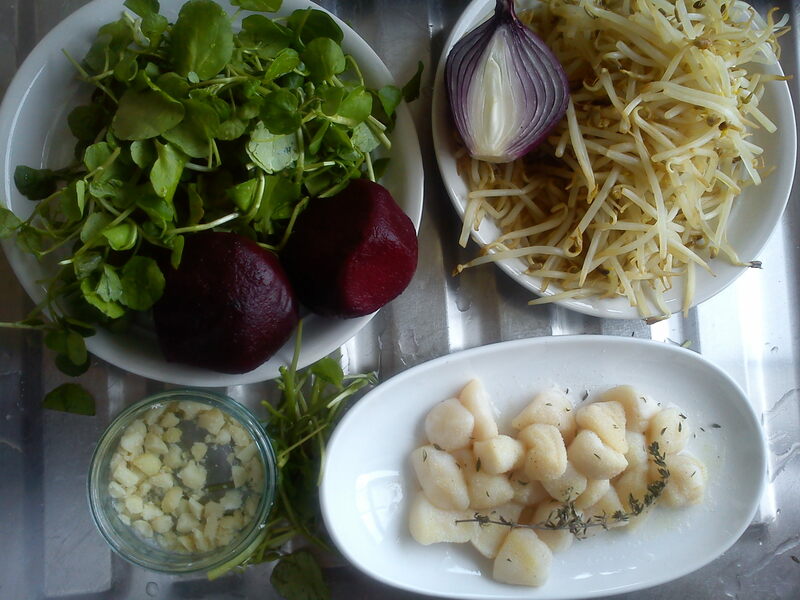 The result will be a sweet salad with warm scallops and onions without added sugar. Now in a big bowl, combine the beansprouts, watercress, macadamia, onion and scallops. Toss and plate up then, drizzle the vinaigrette just before serving. 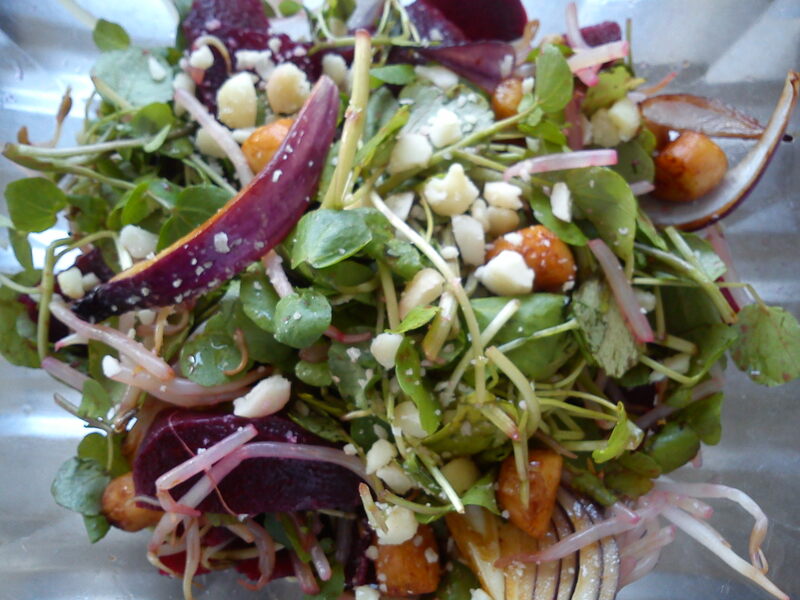 This is such a sweet crunchy and slightly peppery from the still almost raw red onion… this salad is a festival in the mouth with 3 different types of crunchiness (onion, watercress and sprouts, then the frank crunch from the macadamia!) and 3 types of sweetness (scallops sweetness, beetroots and ketchup). I certainly enjoyed it! Can you tell I love my greens? Enjoy this with a glass or 2 of wine followed by dessert. 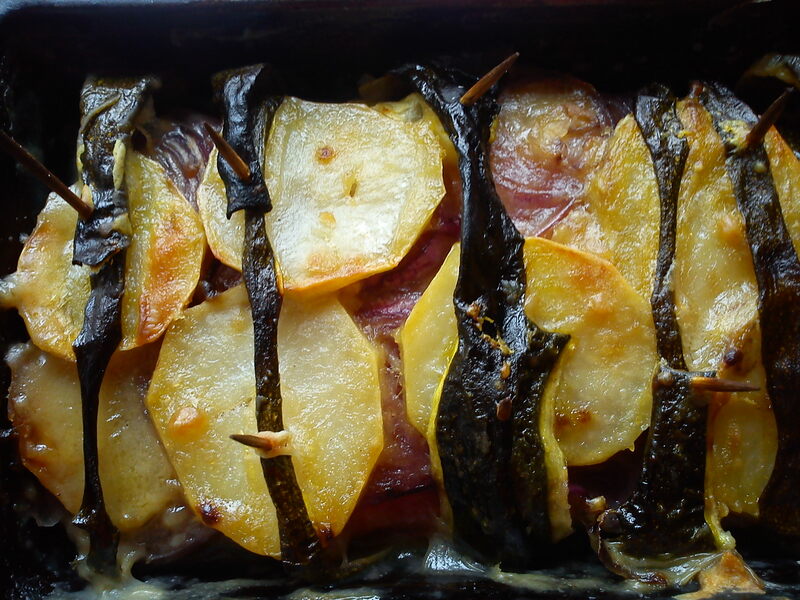 Remember this dish I made with the marrow? I did promised a vegan option and ha forgotten to post it. Here it is. 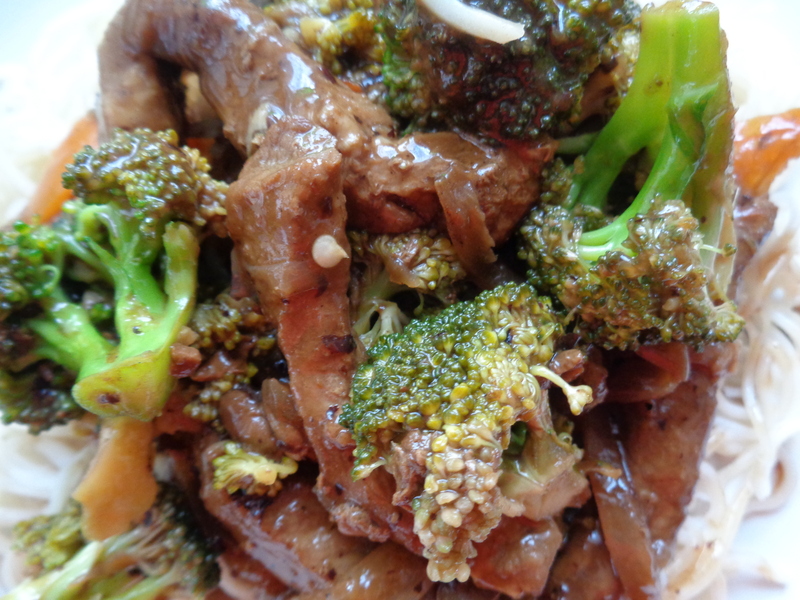 Can you see the Tofu slices? 1 – Peel the marrow and keep the skin strips for decoration. Now slice the peeled marrow in 1cm width and set aside. Peel the potatoes and cut in slices about the size as the marrow. set aside. Now do the same thing for the tomato and red onion. Make sure that your Tofu is deep-fried as it will give texture to your dish. Set aside. 2 – for the batter: The batter will help to hold everything together. Melt about 25g of the butter and crush the whole stock cube in it to dissolve. Add the cream to the mix then, the flour and the finely chopped garlic. Mix well, add salt and white pepper. Set aside. Butter a regular size loaf tin, place 1 layer of potatoes, then a layer of marrow, then onion, then tomatoes, then tofu. Dust with a pinch of salt and white pepper. Then repeat the process. If you can, make sure that a layer of potato is at the top of the dish simply because you will use it as indicator to judge if the dish it cooked. Potato is the hardest of all the vegetables used here. The dark green strips you see on this photo are strips of peels from the marrow that I am using to decorate my dish. The strips were placed on the bottom of the baking tin, then folded over the dish and held with tooth pick just before placing it in the oven. Once the layers are done. Stir the batter previously prepared and pour it, not on top, but on the sides of the layers. 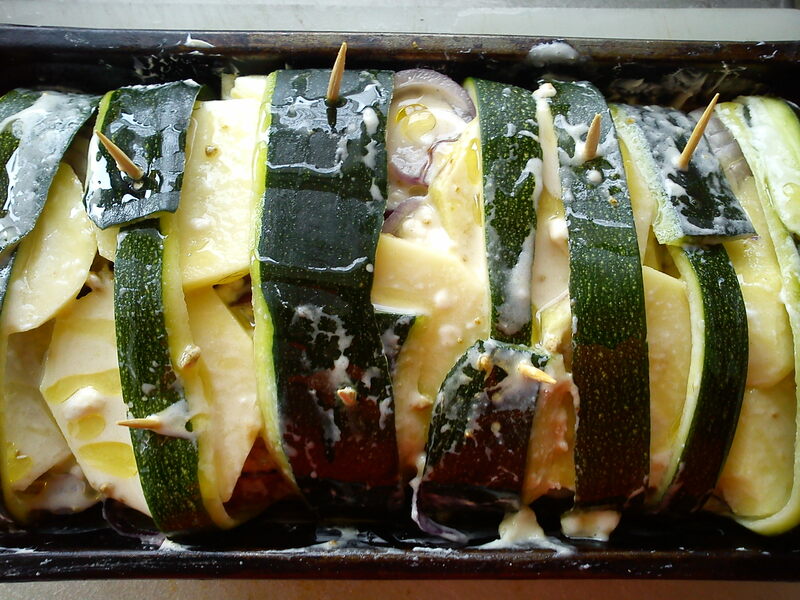 Now place your dish in the oven for 1h20 minutes. Now time to prepare the accompaniment. 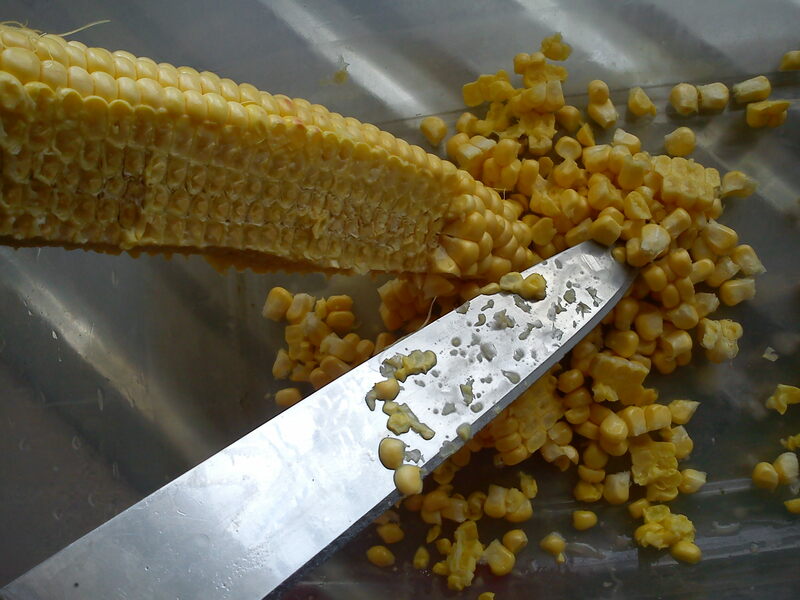 Start by shelling the corn kernels from the cob or simply go through the cob with the knife like I did on the picture above. 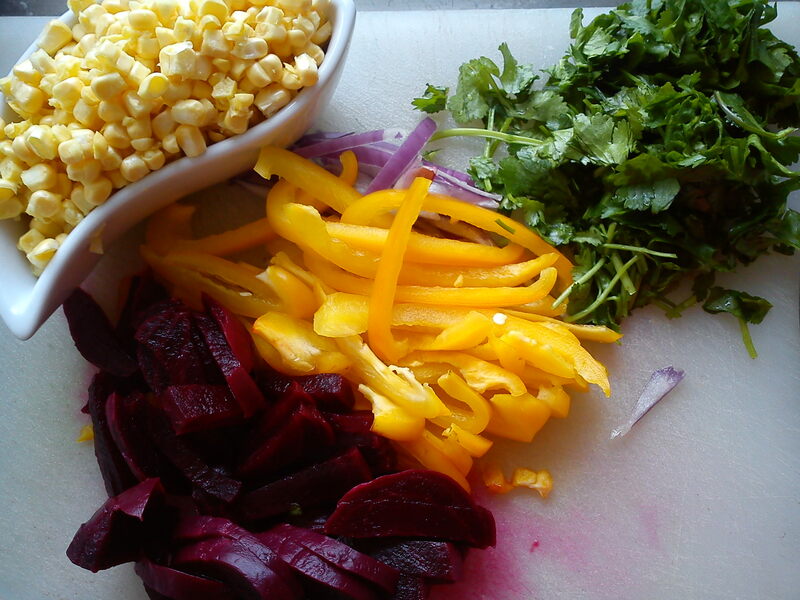 Chop separately all the elements of your dish then set aside. Now, in a frying pan, melt the butter and fry the chopped onions and thyme until brown. Now, add the sweet corn and stir for 2 minutes. 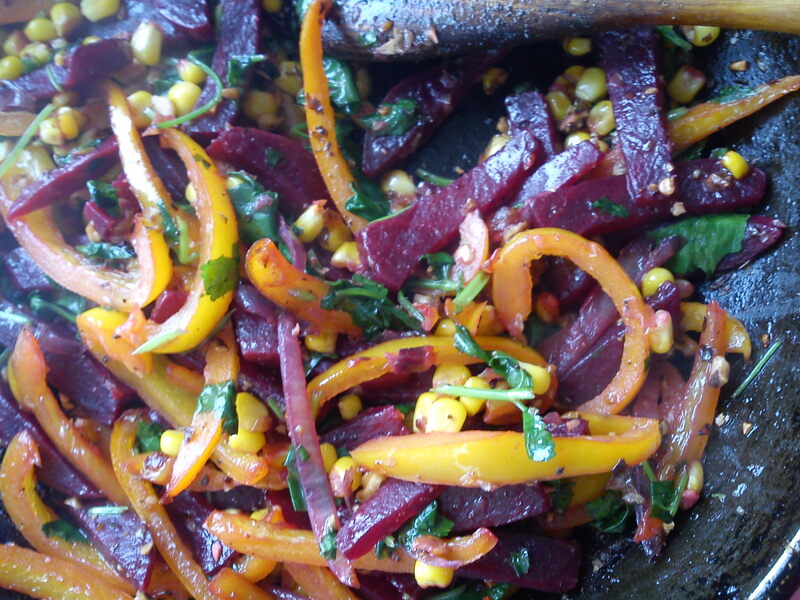 Then add the sweet pepper in the mix, stir for 2 minutes, add the beetroot and the fresh parsley, stir well for 1 minute and add the crushed walnut. 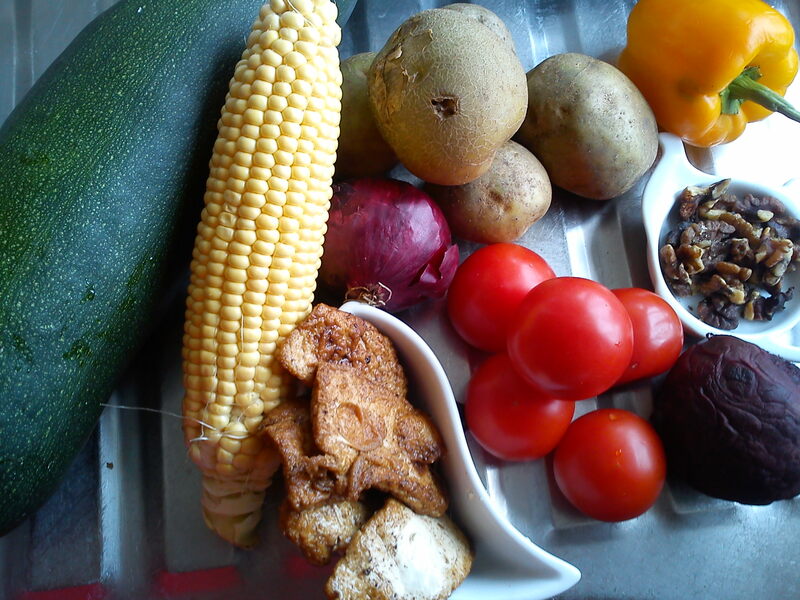 Season with salt and pepper, Mix, cover and remove from the stove and cover so the steam will finish softening the vegetables. It is ready. Time to check on your layers in the oven. The hardest ingredient in the dish is the potato. If you put a knife through the dish and it goes through smoothly, and comes up just slightly moist, then your dish is ready. if not, add cooking time to your oven. Please note: not all oven perform with the same power. Leave your dish to cool for few minutes then, serve. Don’t forget to post a comment! Preheat the oven at 180C. Wash and cut the strawberries. Put them in a colander to drain. Place in the fridge. the bottom of the dish. Remove the extra on the edges and prick (lots of picks) the bottom of the dish before bake to avoid it bubbling up. If you’ve got baking beans for blind baking, use them. Place the pastry in the oven for up to 30 minutes at 180C depending on how golden you want it. Once this is ready, remove from oven and allow 30 minutes to 1 hours to cool down completely. For the filling – Crème Patissiere: Split the milk and put 400ml in a deep pan with the split vanilla pod and seeds. Set aside. In a bowl, combine 100ml milk, all the egg yolks, and the sugar. Beat until the sugar is dissolved. Add the ground almond and sieve in the flour. Mix well and set aside. Place the pan with milk on heat and let the milk simmer until it starts bubbling up. Turn down the heat, remove the vanilla pod and slowly add the content of the bowl containing the mix with eggs, sugar, and almond while continuously whisking the mix. Once the bowl is empty, remove the pan from the hob and continuously whisk until the mixture becomes silky and homogenous with the consistency of a natural yogurt. Now transfer the contents of the pan into a clean bowl and leave it to cool down. Once both the pastry case and crème patissiere are cold, fill the case with the cream and assemble the strawberries as you wish. In a small pan, melt the butter. Then add the sugar and stir for 2 minutes until the sugar starts to caramelise. Now add the 50ml infused tea (without the teabag) and the apple halves. Stir and cover for 5 minutes. To allow the apples to soak up the flavours and soften a bit. After 5 minutes, remove the cover and continuously stir the apples turning them from side to side until they become golden and the liquid on the bottom of the pan becomes heavy with a syrup-like consistency. The liquid should taste like liquid caramel. Remove from the pan and place in a heatproof dish to cool down. I did this to serve with a basic vanilla ice cream (top picture), but could be used with natural yogurt or as a topping on porridge… you can even use it to top a basic pound cake with lemon zest. It is just too sweet to be eaten as it is. Only a half apple was used for the portion above. This can be kept for about 3 days in the fridge. Note: I used eating apples because they are very resistant and will not breakdown during the cooking. The cooking apples tend to be too weak and also too acidy for my liking. For this dish you will need about 2, 3 table spoons of the roast cherry tomato (and oil) from the previous post. Prep: Halve the squash and clean the inside. Rinse and cut as on the picture, about 1cm thick. No need to peel as the skin of the butternut squash is edible. Wash and cut the potato about 1cm thick same as the squash. Any bigger than that it will take ages to soften. Cut the onion in big chunks. Grate the garlic. Chop the parsley. Direction: In a pan, melt the butter, fry the butternut and potato. Add garlic, herbes de provence, salt pepper, stir for 5 minutes to allow the squash and potato to absorb the flavours. Now add the onions, stir and cover for another 5 minutes at medium heat. Do not add water. After the 5 minutes. Taste and adjust seasoning. Turn off the heat and add the chopped parsley. Prep: rinse the fish and set asside. 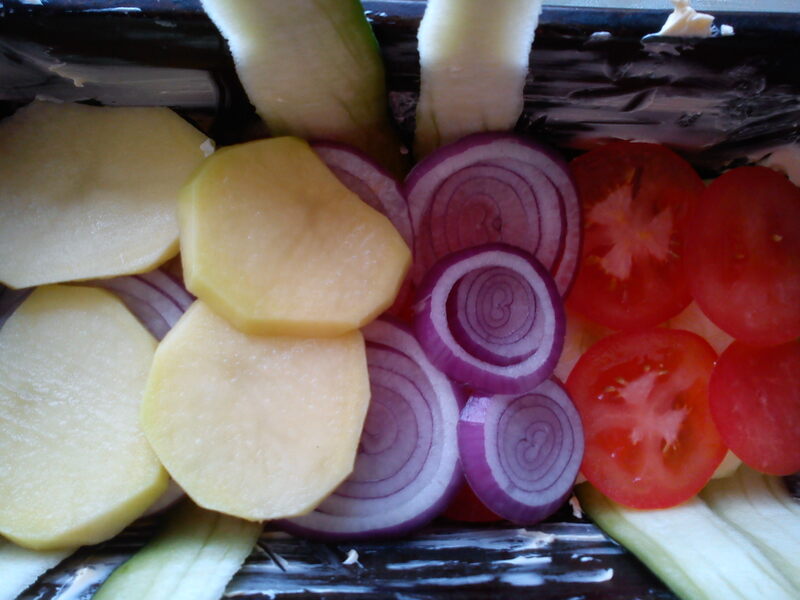 Cut the spring onion, quarter the remaining half of the red onion. Dice the garlic and crush the cubes. Direction: Pour the milk in a small sauce pan with the spring onion, red onion, garlic, stock cube, salt & pepper. Bring the milk to boil and put the fish in it. Reduce the heat and leave the fish to cook for 5-7 minutes. Hopefully by this time the Poêlée is ready. Heat the cherry tomatoes pipping hot before spooning it on the fish. as you serve. Note: the Poêlée and cherry tomatoes can be reheated, but the fish would have to be cooked at the last minute just before serving. As suggested. Bon appétit et a bientot.